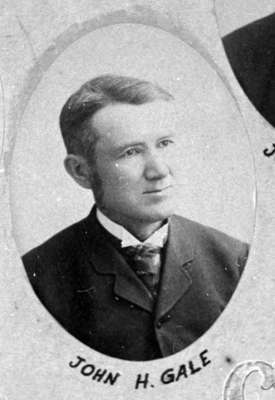 A black and white portrait photograph of John Hamlin Gale (1839-1914). This photograph is from a frame of portraits of members of Composite Lodge No. 30, AF & AM. John Hamlin Gale was born at England in 1839 but lived most of his life in Whitby, Ontario. he was a teacher at Almonds and Baggotsville schools and was the teacher at Dufferin Street School at Port Whitby from about 1887 to 1910. He died at Whitby on February 24, 1914 and is buried at Groveside Cemetery, Brooklin. John Hamlin Gale, 1892, W.E. O'Brien. Whitby Archives 31-009-356.